400 Backers! 85% Funded! TEN DAYS TO GO! The Multiplex 10: the animated short Kickstarter project has hit two milestones at the same time: 400 backers and crossing the 85% mark toward our funding goal! We’ve still got a ways to go, but with ten days remaining, we’re in excellent shape. If you’d like see turn Multiplex into a Multiplex 10 web series (or TV series?!) distribution is really crucial. Head over to Kickstarter and pledge your support today! Hello! The Multiplex 10 Kickstarter project ends in just over 14 days. As of this writing, we are a little north of $12,000, so just past 80% of our goal. Judging from my last two Kickstarters, we’re doing very well. The final week should pick up considerably over this past week. Announcing… Multiplex Movie Review milestone goals! Multiplex 10: the animated short has raised over $11,000 in pledges from 330 backers as of this writing, just over a week after launch. While we’re not officially greenlit yet — not until the project passes $15,000 — things look good. I’m really thrilled at the prospect of bringing the characters from Multiplex to a new medium. Multiplex was, at its heart, a love letter to movies. It talked about movies directly, of course, but it also talked about how we watch them, how we talk about them, and how our shared love (and hatred) of movies — and all of our entertainment — makes us who we are and brings us together. There were limits to doing this in a relatively grounded comic strip. 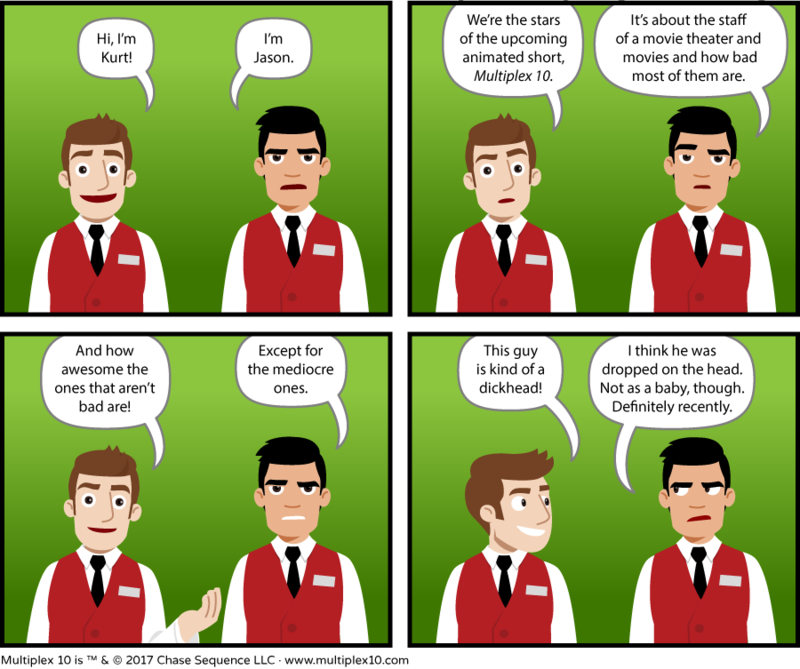 Bringing Jason and Kurt to life in animation opens up a whole new dimension for affectionately lampoon the movies we love and hate: time and sound. And in terms of stories, the web series will (eventually) get weirder and weirder. Think: Clerks meets Community. The first episode is very much an origin story, and there’s only so much we can pack into its eleven minutes… but hopefully we’ll get to do more episodes in the future, one way or another. The webcomic may be over, but this short is only the beginning. 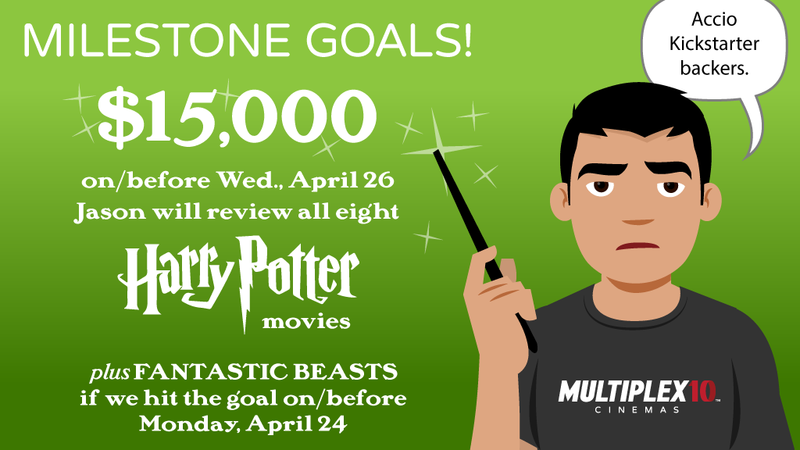 In order to — fingers crossed — hit our base goal sooner rather than later, if we can reach $15,000 on or before Wednesday, April 26, I’ll post Multiplex Movie Review comics for all eight of the Harry Potter movies. And if we do it by Monday, April 24, I’ll throw in Fantastic Beasts, as well. These movie reviews will be slightly different than past ones, though — Jason will review them at the age he was when each movie was released. So the first ones will be set before the comic strip began, and we’ll see him get older and older over the course of the reviews. This video show three early steps in the (long, long) process of getting from script to screen. Here, we’re looking at a shot in the first scene of the short, in which Jay — the snarky Asian employee of Flickhead Video — is seen getting smart with a customer. Our script is already written, so after some time designing the locations and characters, I’ll finish the storyboards. The next step is to do a rough animatic, which is essentially the storyboard but timed out and with a little (very rough) animation added, temp dialogue and sound effects (but no music). Once the timing and everything in this stage is looking good, we’ll record final dialogue. We don’t have that at this point, of course. The third/last shot in this video shows a little movement added between the poses. I’d also sync the mouths at this point, though I didn’t do that here because this clip just has temp audio in it. You get the idea, I hope! Related: Idiot Customer #1 (on the left) could be you. At the $600 level, you can appear in the Multiplex 10 short. If you haven’t already pledged your support, please stop by the Multiplex 10: the animated short Kickstarter project page to learn more about it! We’re hovering at just over $9,500 right now, and the sooner we get past the minimum goal, the sooner Multiplex 10 will officially enter pre-production. Actual animation can’t start until after the funding period, because the final budget determines two crucial specs: what resolution the video will be (1080p vs 4K), and how many frames per second the animation will be drawn at (18 vs 24). Meet (some of) the Multiplex 10 cast and crew on Kickstarter Live! In other news, your enthusiasm for the project (and the outpouring of love after the final Multiplex was posted) has been incredible. I didn’t expect to be announcing this milestone so quickly: In just over twenty-four hours, the Multiplex 10: the animated short Kickstarter project has raised $7,392 in pledges from 200 backers — just barely shy of half its base goal. We still have a long way to go before we’ve met the base goal, of course, but… this was a good day. Thank you all so much for your support! UPDATE: The livestream is now over, but you can replay it (at the same URL) to watch me, producer/co-writer Dana Shaw, co-produce Joe Dunn, and composer Tangelene Bolton talk about ourselves, our work, and, of course, answer some of your questions about Multiplex 10! 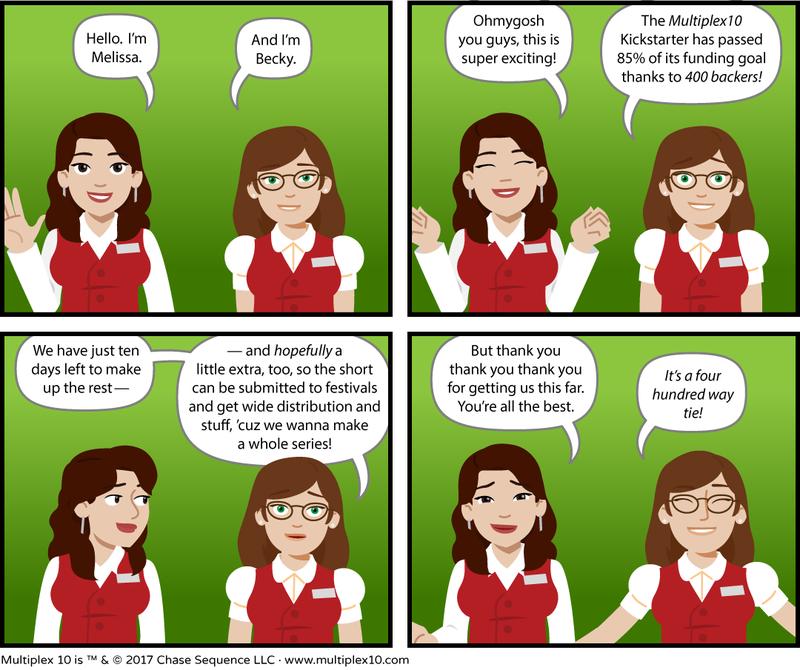 The Multiplex 10: the animated short crowdfunding project has launched on Kickstarter! Watch the video below for the main details and then venture over to the project page to either learn more or pledge your support. There are some limited (discounted) rewards, so hop in early! Early pledges really help establish a Kickstarter project’s momentum. And please share the Kickstarter project with your friends on the social medias… especially the ones who work at movie theaters.